Transitions, the part of a triathlon, duathlon or aquathlon where you change between one phase of the event and another are a potential minefield for both beginners and experienced athletes alike. A bad transition for an elite can, literally, cost them the race while for an age group athlete it can make the difference between qualification for the Worlds and watching from the sidelines. When you watch the elite athletes change from bike to run it’s often hard to believe just how fast they do it - 15 seconds from racking the bike to running sounds fast but is probably well below average with many of the top pros consistently hitting single digit times. So, how do they get to be that good? Well, by practising their technique - just like for any other part of the sport. And there’s nothing to say that you can’t do the same. One of the more entertaining club sessions you can do involves swimming a regular set but finishing with a 400m effort followed by jumping out of the pool and changing first into bike kit then running 50m or so in that and then changing into run kit before heading out for a dash around the sports field at the back of the pool. Do this a few times and you’ll soon pick up some pointers in what works and what doesn’t! Duathletes need to practise as well but with a dry start while anyone planning an aquathlon career needs to learn that dry clothes simply won’t go over wet skin. Tying up trainer laces isn’t just "last week" it’s "last century"! While the principle is the same - faster shoe changes - the way they work is not and it’s worth figuring out which is best for you. Lace locks are spring-loaded clamps that grip a regular shoelace and effectively replace the bow. The best way to fit these is to thread both lace ends through the clamp and then tighten the laces to a comfortable fit. Now thread one lace under the bottom loop of the laces (the loop nearest the toes) and then tie it onto the other lace with a reef knot. This give a secure loop of lace that the lock can slide up and down and will enable you to find it without looking. It also stops the spare bit of lace flapping around when you run. Elastic laces are a replacement for standard laces and are designed to have enough give in them to allow you to slip the shoes straight on. The tension in the elastic will then hold the lacing tight enough that your shoes stay on while you run. There are, however, two potential issues that elastic laces don’t always address. First, when you initially tie the lace off you have to make a decision about wearing socks or not - the tension will be different if you set it up for no socks and then wear them - the shoes may be too tight for comfort or to be able to get them on quickly. The second problem is again related to tension in that you will probably set up the shoes at home but you’ll be changing after riding hard on a bike, possibly in the heat and you may find that the lacing is too tight because your feet have swollen. You can, of course, use lace locks with elastic laces but it sort of defeats the point. The much maligned number belt can be a great time saver - or it could cost you two minutes! 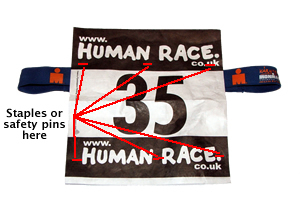 The rules clearly state that number belts are legal (although some organisers may suggest otherwise...) BUT the rules also say that your number must be clearly visible at all times to officials. So, how do you fit a number on a belt so that it won’t roll up and disappear or flap around annoyingly? Take one number (remember to write essential contact details on the back and any medical information) and place it face down and the wrong way up on any flat surface. Now take the second number and put it face up and the right way up on top of the first number. Using safety pins, a stapler or adhesive tape secure all four corners of the numbers together. You should now have a double sided number that will always show the right way up if it gets turned over. Now put two pins or staples through the edges of the number about a quarter way down on each side then flip the number and repeat. You can use tape here if you wish, it works just as well. What you now have is a double sided number with a central slot running through it and it is through this slot that you pass the number belt. The number now hangs properly, doesn’t flap and even if it turns over will still show the correct number. The final touch - only if these are Tyvek numbers (the sort that you cannot tear) - is to crumple the numbers up and then smooth them out a couple of times. This makes them much more pliable and they won’t flap around like flags when you are on the bike. If the organiser has only given you one number then you have to use method 2 which is to safety pin the number onto the number belt using three pins. First, if it’s the right sort of number, do the crumple and smooth trick and then pin it onto the belt WHILE WEARING THE BELT approximately a quarter way down the number. Always pin on while wearing the belt so that the pins don’t tear out when you stretch the belt to put it on. This obviously cannot do the flip-over trick but it’s a whole lot better than pinning it to your kit (again, if you do this put the kit ON first...) and going with the top hanging method. One last word of warning about numbers. Pinning them onto your kit is great - they are clearly visible at all times as long as you pin them in all four corners but it’s a VERY good idea to check that you haven’t pinned right through the top... ...makes it impossible to put it on and can be very, very amusing to watch. Transitions can be big and dis-orienting - and that’s before you actually start the race! The temptation to mark your spot by tying balloons, flags or whatever to the nearest bit of fence is very strong but will only result in you getting a telling off from the transition crew or, worse, the referee. As for sprinkling a line of talc or writing your initials in the stuff - well, just don’t go there! However, there are several perfectly legal ways of marking out your spot. The first, and most obvious, is to use a very recognizable coloured towel as your transition mat - perfectly legal and, as long as it’s an odd enough colour, it works every time. The same is true of your transition bag, garish yellow might not be the thing for the departure lounge but it’s fine tucked under the rack by your bike. The best advice, however, is the simplest. Memorise the place, relate it to local landmarks and then walk the route to the position from both the swim and bike entry points. Losing your bike is seriously embarrassing, parking your bike in someone else’s slot and taking their shoes for a run (yes, it happens quite often!) is an offence that will get you a red card from the referee and potentially a major bust-up with the other competitor. How can you possibly save two minutes every time? The answer is to leave your helmet alone! The rules of triathlon and duathlon state that your helmet must be on and fastened up before the bike is taken from the transition stand or rack and it must remain on and fastened until after the bike is back on the stand or rack. Clear enough - but at every race athletes will try to be clever and get the helmet off as soon as they dismount. The full penalty is two minutes added to your time but as the officials have to stop you first and explain what you have done wrong they will often waste many tens of seconds of your time doing the "education bit" even if you don’t get the full two minutes. Oh, and don’t think they didn’t notice you taking it off again after you had run past them - a guaranteed penalty there! The solution is simple - train yourself not to touch the helmet and save the penalties or the occasional deliberately time-wasting lecture from the officials. Ask any transition official where the most fun can be had and the answer will invariably be "the mount line". Why? Because of all the people trying to emulate the professionals by having their shoes already clipped into their pedals - and making a spectacular hash of it. The professionals practice this technique on a regular basis and, unlike the age group waves, they do all know what they are doing (well, most of the time...). Unpractised age groupers attempting to put their feet into shoes while trying to ride very slowly almost always results in one or more major disasters. Meanwhile, the smarter athletes have either run carrying their shoes or run in their shoes and have no problems getting away smartly. Remember, if you want to look like a Pro you need to train like a Pro - otherwise you just look like a wally and, worse, you may well knock someone else off as well. Having a clear understanding of the sequence of events that will happen in a transition and playing them through in your mind will make thinks happen faster and smoother. Part of the key to fast transitions is to visualise this process and dry run it time and again - if you watch the experienced athletes getting ready you can often see them going through the routine as a dry run. It’s a good thing to think about T1 while you are getting ready for the swim start and, likewise, it’s a good thing to think about T2 during the last mile or so of the bike. An essential item in your transition bag should be a large black bin bag. Then, if the worst happens and it starts to rain (or looks like it might rain while you are out on the bike) you can wrap up your dry kit nice and safely so that afterwards you still have something warm and dry to wear. A carrier bag or two is also useful, both for the wetsuit trick and for putting your running shoes in so they stay dry. There’s nothing quite so nasty as getting to T2 and finding your running shoes have completely filled with water! Years of crewing and refereeing in transition have convinced me of one indisputable fact: the average athlete has no idea of where the entry and exit point are! Despite organisers going to the trouble of providing transition plans and mounting enormous signs on the fencing probably the most asked question will be "where’s the swim in/bike out/etc". Given the amount of money and effort it has taken to get to that point it’s worth investing the five minutes it will take to walk the routes within transition and figure out what else might be happening along the way. Big, complicated transitions often mean that there will be people coming and going in all directions so if you already know that the swim in and bike in are at the same end of transition you’ll have figured out that somewhere down the line one is going to be crossing over the other. Just being prepared for that can save an accident or an un-necessary delay. 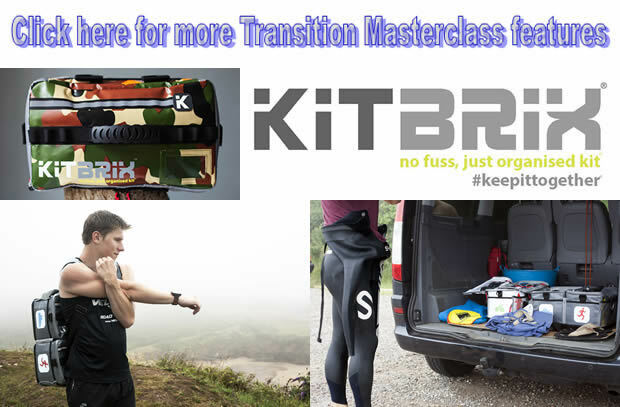 So, there you have our top transition tips - do you have some of your own? If you do please send them in and we’ll add them to the pile. In 5 years of Triathlon I have never used a 'traditional' number belt. I have successfully used an old dismembered bum bag. The belt clicks toegther as per normal to wear, so is just as fast to attach hout of the water. One side has a appox 12 cm by 8 cm padded cloth panel below the 'belt' . When a number is pinned to the top of the belt and at the bottom of this panel the number doesn't flip. I pin the other number to the other side of the 'belt' so there are numbers back and front. The 'belt' part is wider (about 5 cm) than the traditional type and so even the number at the back doesn't flip. It' s comfortbale to wear on bike and run and doesn't move around too much. I make sure I have enough pins before I attend a race and but keep them in the belt between races until they rust up then replace them.